[04/02/2019 @ 08:43 PM] Book this fare on: Priceline, BookingBuddy, Travelocity, SkyScanner, Expedia, Orbitz, Hotwire, CheapTickets. 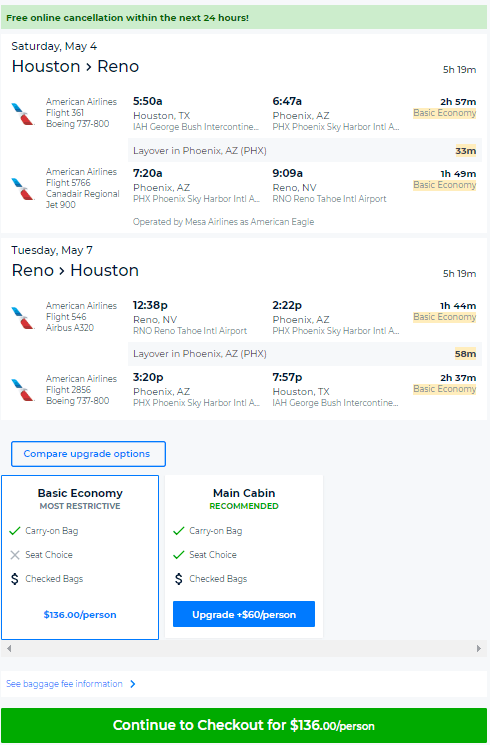 American Airlines has round-trip flights from Houston (IAH/HOU) to Reno or San Francisco (RNO/SFO) for $136-$146 with a connection. April to February. A few Weekends available. Origin/Destination reversible. Note: Carry-on bag is allowed for free on American Airlines. You can avoid paying for seat selection by accepting the randomly assigned seat at the gate. Reno – Weekend Example Dates: (BookingBuddy / Priceline) May 03 – May 05 / Jun 28 – JuL 01 / Sep 27 – Sep 29 / Sep 27 – Sep 30 / Other dates: There are more dates available than the ones we list here, experiment on your own. Reno – Extended Weekend Example Dates: (BookingBuddy / Priceline) Apr 19 – Apr 23 / Apr 19 – Apr 24 / Apr 26 – Apr 30 / Apr 26 – May 01 / May 03 – May 07 / May 03 – May 08 / May 09 – May 12 / May 09 – May 14 / May 16 – May 21 / May 30 – Jun 04 / Jun 06 – Jun 11 / Jun 07 – Jun 11 / Jun 07 – Jun 12 / Jun 14 – Jun 19 / Jun 20 – Jun 25 / Jun 21 – Jun 25 / Jun 21 – Jun 26 / Jun 27 – JuL 01 / Jun 28 – JuL 03 / Sep 27 – Oct 01 / Sep 27 – Oct 02 / Other dates: There are more dates available than the ones we list here, experiment on your own. 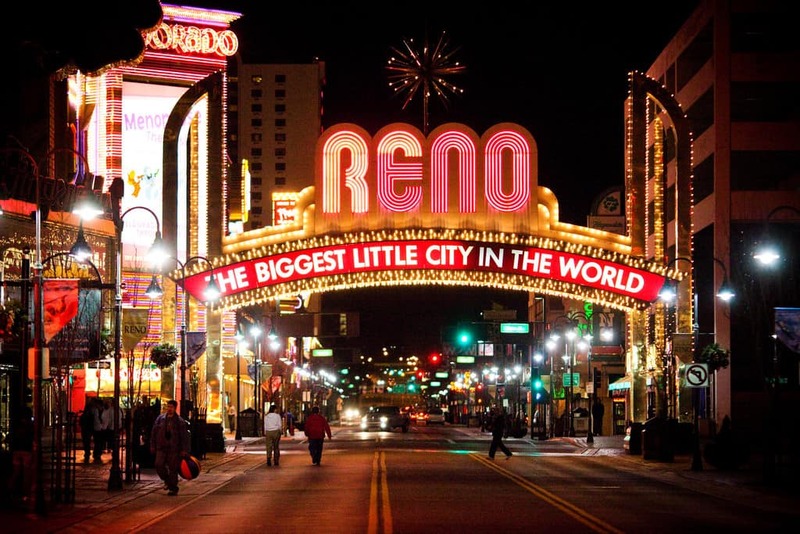 Reno – TUE/WED/SAT Example Dates: (BookingBuddy / Priceline) Apr 16 – Apr 23 / Apr 17 – Apr 24 / Apr 20 – Apr 23 / Apr 20 – Apr 24 / Apr 23 – Apr 30 / Apr 24 – May 01 / Apr 27 – Apr 30 / Apr 27 – May 01 / Apr 30 – May 07 / May 01 – May 08 / May 04 – May 07 / May 04 – May 08 / May 07 – May 14 / May 08 – May 15 / May 11 – May 14 / May 11 – May 15 / May 14 – May 21 / May 15 – May 22 / May 18 – May 21 / May 18 – May 22 / May 22 – May 29 / May 25 – May 29 / May 28 – Jun 04 / Jun 04 – Jun 11 / Jun 05 – Jun 12 / Jun 08 – Jun 11 / Jun 08 – Jun 12 / Jun 12 – Jun 19 / Jun 15 – Jun 19 / Jun 18 – Jun 25 / Jun 19 – Jun 26 / Jun 26 – JuL 03 / Sep 03 – Sep 10 / Sep 07 – Sep 10 / Sep 07 – Sep 11 / Sep 10 – Sep 17 / Sep 11 – Sep 18 / Sep 14 – Sep 17 / Sep 14 – Sep 18 / Sep 17 – Sep 24 / Sep 21 – Sep 24 / Sep 21 – Sep 25 / Sep 24 – Oct 01 / Sep 25 – Oct 02 / Sep 28 – Oct 01 / Sep 28 – Oct 02 / Other dates: There are more dates available than the ones we list here, experiment on your own. San Francisco – Weekend Example Dates: (BookingBuddy / Priceline) Aug 23 – Aug 25 / Sep 06 – Sep 09 / Sep 13 – Sep 15 / Sep 13 – Sep 16 / Sep 20 – Sep 23 / Sep 27 – Sep 30 / Jan 31 – Feb 02 / Jan 31 – Feb 03 / Feb 07 – Feb 09 / Feb 07 – Feb 10 / Other dates: There are more dates available than the ones we list here, experiment on your own. San Francisco – Extended Weekend Example Dates: (BookingBuddy / Priceline) May 09 – May 14 / May 30 – Jun 04 / Jun 07 – Jun 11 / Jun 07 – Jun 12 / Jun 13 – Jun 18 / Jun 14 – Jun 18 / Jun 14 – Jun 19 / Jun 20 – Jun 25 / Jun 21 – Jun 25 / Jun 21 – Jun 26 / Jun 27 – JuL 01 / Jun 27 – JuL 02 / JuL 05 – JuL 10 / Aug 22 – Aug 25 / Aug 22 – Aug 27 / Aug 23 – Aug 27 / Aug 23 – Aug 28 / Aug 29 – Sep 01 / Aug 29 – Sep 03 / Sep 05 – Sep 09 / Sep 05 – Sep 10 / Sep 06 – Sep 10 / Sep 06 – Sep 11 / Sep 12 – Sep 15 / Sep 12 – Sep 16 / Sep 12 – Sep 17 / Sep 13 – Sep 17 / Sep 13 – Sep 18 / Sep 19 – Sep 23 / Sep 19 – Sep 24 / Sep 20 – Sep 24 / Sep 20 – Sep 25 / Sep 27 – Oct 01 / Dec 05 – Dec 08 / Jan 16 – Jan 19 / Jan 16 – Jan 21 / Jan 23 – Jan 26 / Jan 23 – Jan 28 / Jan 30 – Feb 02 / Jan 30 – Feb 03 / Jan 30 – Feb 04 / Jan 31 – Feb 04 / Jan 31 – Feb 05 / Feb 06 – Feb 09 / Feb 06 – Feb 10 / Feb 06 – Feb 11 / Feb 07 – Feb 11 / Feb 07 – Feb 12 / Other dates: There are more dates available than the ones we list here, experiment on your own. Do you want an e-mail notification when new deals are found? Subscribe to the Escape Houston e-mail notification list and never miss another deal. I was able to pull this up on Priceline. Screenshot taken when this post was initially created. See timestamps at the top of this post. If you plan on booking a hotel, use our travel coupon codes to save up to 15% to 20% off. Alternatively, you may be able to save the most money by booking your trip as a Flight + Hotel package on Priceline, Travelocity, or Orbitz. Note: OTAs such as Travelocity and Priceline allow free cancellation without penalty within 24-hours after you purchase. As deals sell-out or expire quickly, this policy will allow you to “lock-in” the cheap fare while you sort out a plan. Just keep in mind that after 24-hours, you will not be able to cancel without the regular penalty. Book this fare on: Priceline, BookingBuddy, Travelocity, SkyScanner, Expedia, Orbitz, Hotwire, CheapTickets.